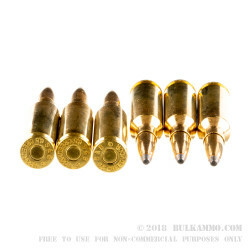 This an excellent 6.5mm Creedmoor load for clearing feral hogs out of wide open spaces as well as for stalking deer in lush forests. 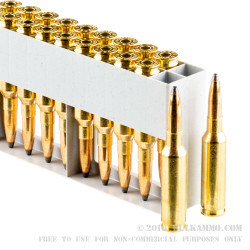 Each round is assembled using a reloadable brass casing with carefully measured dimensions and a clear flash channel. The case houses clean-burning powder which is ignited by a non-corrosive Boxer primer; lack of mercury or other caustic materials helps to protect your rifle's components as it is passed down to each generation of your family. 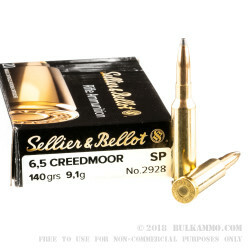 S&B (Sellier & Bellot) finishes each cartridge with a soft point projectile which has a strong copper jacket and a naked lead nose. At 140 grains, this bullet matches heavier options in the caliber for pronounced potential energy at longer distances, a trait desired by precision hunters. When the bullet enters a game target, it will experience a controlled rate of expansion that allows it to penetrate past thick layers of bone and fat before passing on its energy to the heart and lung area; this gives the round a greater chance of yielding a one-shot drop while reducing the chance for lethal exit penetration to occur. S&B is a Czech outfit that is owned under the CBC parent group. 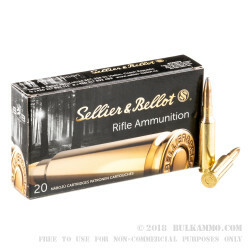 Nearly two centuries of experience combined with cross-talk from their sister companies allows S&B to manufacture ammo that is both functional and highly affordable.